Es Devlin will add a fifth lion to Trafalgar Square for this year's London Design Festival, featuring a fluorescent coat and a mouth that continuously spouts out poetry. Devlin, who has previously created sets for Katy Perry, Kanye West and Beyoncé, is one of four designers that will create Landmark Projects for the festival. Her project, called Please Feed the Lions, is set to appear overnight in Trafalgar Square on Monday 17 September. The public square often houses art installations, thanks to the introduction of the Fourth Plinth project in 1999. But this is the first time that another lion will join the four bronze relief statues that have stood at the base of Nelson's Column since 1867. Unlike the existing lions, Devlin's lion's mouth will be open, as if roaring. An LED screen embedded in the mouth will display lines of poetry, generated using new machine learning technology. "The thought lodged in my mind: what if we could invest the lion with a diversely crowd-sourced collective poetic voice?" said Devlin. "Over the past two years we have heard a lot of loud prose about national identity, but much less poetry. Much of the debate has been prosaic and divisive: I want to make a piece that is poetic and collective." The lion's voice will be generated by an algorithm that is trained on millions of words of British poetry, sourced predominantly from the period during which the original lions were cast. The algorithm takes each of the words fed to it and fuses them with one another and with the words of hundreds of 19th century poets. It has been developed by creative technologist Ross Goodwin, with whom Devlin collaborated on The Singing Tree, which generated a collective carol at the V&A over Christmas last year. The public will be able to contribute to the collective poem, by typing words into a screen next to the lion. 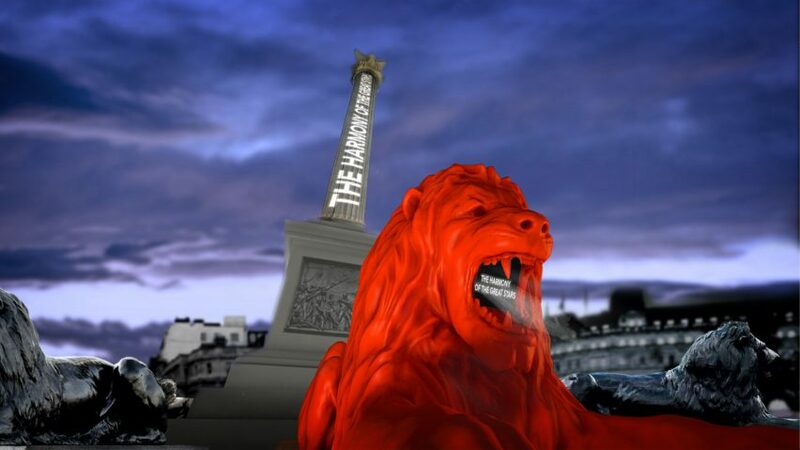 At night, the poem will also be projected onto the body of the lion, and onto Nelson's Column. Es explains that she took a LIDAR scan of one of the existing Trafalgar Square lions and used the data to create a 3D model. The lion is currently being CNC-formed in resin-coated high-density foam, which will be painted fluorescent red orange. The installation is being created in collaboration with Google Arts & Culture and The Space, a digital commissioning body which works to ensure broad access to the arts through digital technology. It will simultaneously become an online exhibition to be accessed worldwide. This year's London Design Festival takes place from 18 to 23 September. Other Landmark Projects will be created by Waugh Thistleton Architects, Scholten & Baijings and Kellenberger-White. Last year's Landmark Projects included a huge inflatable sculpture emblazoned with Camille Walala's signature colours. The last time the festival hosted a Landmark Project in Trafalgar Square was in 2014, with A Place Called Home. Four designers, including Ilse Crawford and Jasper Morrison, put their own distinct decorative mark on a set of four outwardly similar "houses" erected in the square, to express what home meant to them.